For those who are looking for an adventure, perhaps a bit like something they’d seen on the hit show “Survivor,” Kayak Charters is the place to call. From helping put together a survival kit, to teaching how to start a fire from scratch, to showing how to procure water, Kayak Charters can teach it all. They offer survival classes and training that is designed to help someone survive out in the wilderness or even after a natural disaster, like a hurricane. “We will show you, train you and build your confidence with sound survival techniques,” said Dominick Greco, the founder of Kayak Charters, who has worked with victims of natural disasters when they were left without water, food and electricity. While some survival training is conducted in the classroom, most of the time, it is out in the field — back bays, mangrove trails and rivers — where the training also includes lessons in the ecology, especially when it pertains to the resources that can be used to help one survive, such as the burl knot (tree fungus) that can be used for keeping coals hot, or the coconuts that can be turned into various survival tools. The experience is so interesting that a pilot show about Kayak Charters, with a focus on kayaking, fishing and survival in the local waters, was recently shot. While survival training may, at first, seem like it is geared towards those who are somewhat versed in the wilderness, Kayak Charters tailors the training based on the needs of the participants. The training actually begins with the first phone call, where Greco, his business partner, Andrei F. “Drei” Stroman, or one of their staff members initially assesses what needs to be taught, and what experience the participants already have, so that the right program can be offered — whether it’s more of a standard tour or trip, or one that is completely tailored from top to bottom. “Like all of our programs, the survival training can be individualized,” said Greco, who, along with his staff, brings more than 60 years of background experience into the training sessions. They also have certifications in a variety of areas, such as Survival, the American Canoe Association (ACA) and Cardiopulmonary Resuscitation (CPR). “Safety comes first,” said Greco who explains that his team always carefully checks the weather and the tide reports before heading out on any trip, whether there is one person along or there is a large group heading out. Many participants wind up becoming Kayak Charters club members as they can work through a variety of training sessions offered at their own pace. “We work with snowbirds who complete some training when they are here and more when they come back,” said Greco, who also helps with trip planning, such as pointing out good places to stay and dine. “We bond like family,” added Greco. 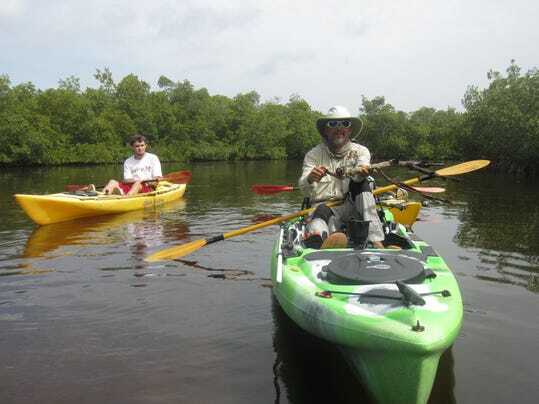 Kayak Charters also offers guided naturalist and eco tours, rigging and outfitting, fishing charters and fly fishing. “We work with beginners up to professionals,” said Stroman, who is also a renowned fly fishing instructor. Stroman said that at Kayak Charters, they pride themselves in providing the best information and techniques for the local waters in Southwest Florida and beyond. Kayak Charters also offers a number of programs and summer camps for children, where they can learn about fishing, kayaking and even survival. They even offer a military program, “Open Wounds,” where Kayak Charters shows appreciation for returning troops by donating their time and energy. Also individualized is where they launch. They have more than 100 sites that they work out of and are always open to new types of experiences themselves. “We have experience in the Florida wilderness, the California mountains, and even in the deserts of Arizona,” said Greco, who said they can go just about anywhere. Many of their launches connect to The Great Calusa Blueway, a 190-mile marked paddling trail that meanders through Southwest Florida waters. Located on the south side of Pine Island Road in the heart of Matlacha. Tours and programs are offered at various locations throughout Southwest Florida. When: 365 days a year. Overnight tours and programs are also offered. take to the bank…literally. One of the all world pro fishermen, Gary Klein, started out fishing four to five days a week from shore – as you are no doubt aware, Klein parlayed the knowledge gained into a career. In this day and time some of us (maybe many of us) aren’t lucky enough to own a boat, or maybe we can’t afford the gas at four bucks a copy. Don’t despair - catching fish is easy when you have a Kayak, and my favorites are the models from Ocean Kayak. •· California’s Gil Rowe holds the world record (9.4) for spotted bass. That record bass was just one of the 60 spots weighing five-plus pounds that Rowe landed from shore. •· By wading, kayaking, or utilizing a float tube, the low profile will allow an angler to make casts well beneath overhanging tree limbs, or under and past otherwise impenetrable walls of trees – spots inaccessible from the deck of a boat. •· When fishing from shore, the lack of mobility can force you to fish each cove and pocket more thoroughly. •· Of the three methods kayaks are the stealthiest way I have found to catch more fish. I personally favor the Ocean Kayak Big Game Prowler and have enjoyed playing a part in bringing a whole line of custom bassin’ accessories to the industry (www.kayak-charters.com). •Take careful note of the clues the shoreline yields - type of baitfish or terrestrials that are present. Compensate for your lack of mobility by forcing yourself to be a more efficient and thorough angler. Since kayak fishing places a premium on being able to see what lays beneath the surface, I also emphasize the need for quality-polarized sunglasses. Newcomers should remember that fishing from a kayak means being 100% exposed to the elements - dress for success! I suggest wearing light or camouflage-colored, quick drying clothing to keep cool and to avoid detection. Kayaks have limited space, so carry a light load and use quality gear since kayak fishing limits the amount of tackle you can have on hand. Take only the most essential tackle and lures. With a little forethought you’ll discover that the Ocean Kayak line-up has ample storage areas and more than enough room for fishing gear. Most kayak anglers benefit from using 6½ to 7-foot rods and I’ve found reels with either a wide or a long-cast spool for maximum casting distance to be most effective. When fishing from a kayak, the length of your cast can be a hindrance. The farther you can cast in certain situations will dictate your success in finding fish. Southeastern Staff Writer for Gary Yamamoto Custom Baits. There is little doubt that barometric pressure affects fishing even though facts are few and far between and hard for some to interpret. Barometric pressure is the force that the atmosphere exerts on the earth and its water. The air has weight to it and the more it weighs the harder it pushes down on the earth. Low pressure happens when the air weighs less, high pressure when it weighs more. Masses of air, varying in weight, move overhead causing air pressure to vary. Radio, TV and NOAA weather stations all talk about the pressure in inches of mercury. Newspapers, on the other hand, often show a weather map with isobars of pressure in millibars (these are lines of equal pressure). If isobars of pressure only show a small change over a large distance, this means that the air mass is stable and the weather will not be changing much. If the isobars are closely spaced over a short distance, this means the barometric pressure is changing rapidly. When you see large bands of isobars close together, this defines a front, which is the interface between high pressure and low pressure areas. Fronts mean changing weather, or unstable air masses. Fishing just prior to, or just after the passing of a front usually means a rapidly changing barometer and can often mean windy weather. If you are reading a weather map, note whether the weather moving toward you contains higher or lower isobars of barometric pressure, in millibars. If it is higher the weather is associated with a high pressure area, if it is lower it is a low pressure area. If the lines are far apart, this means the weather will remain the same for a while. Now, what does this all have to do with fishing you are asking yourself? Pressure changes affect the tides and seem to affect the feeding habits of the fish in both tidal water and non tidal waters. Barometric pressure also seems to affect fish feeding habits. While little actual data is available, it is commonly accepted lore that fish feed well when the barometer is rising and poorly when it is falling. There also seems to be some documentation indicating that the fishing is poor when the barometer is very high or very low. I personally fish about 300 days a year and guide from boat and kayak and use the barometer every time I go out. I have found that when the barometer is rising I have better bites and more active fish; when the barometer is stable fishing is good. But when the barometer is between 30.0 and 29.7 and falling fishing is at its worst. By no means does this falling barometer mean you can’t catch them, but I have noticed a drop in bites and active fish. Saltwater and tidal freshwater fish seem to feed best when the tide is changing, when the barometer is changing and when dusk is changing the light intensity. Of course there are no golden rules to why fish bite, that is why we call it fishing. But when fish bite seems to have direct correlations to changing environmental conditions. Saltwater fishing here in Florida is usually not as good two days before and two days after a full moon. I have personally found that if the barometer is rising that fishing during this time can be productive despite the moons phase. Bass seems to have definite movements and feeding habits here in Florida and around the country that are directly connected to moon phases and barometer pressure reading. I recommend looking more at barometric changes and try to glean some other information from a weather map or meteorologists on what the barometer is before going out on your next fishing excursion. You might just find you had some definite tools missing from your toolbox. The 13lb 2oz. bass below was caught during a rising barometer and a week before the full moon. The bass were feeding like there was no tomorrow. As most big bass this one was solitary and buried deep along a flooded tree. I caught this beauty with a Shad Shaped Worm in color # 021. I use a one–two punch with all my fishing freshwater and saltwater. By one-two punch I mean I use search baits like a Swimming Senko or Phenix Jig (Chatter Bait) to locate fish then I follow up with a slower more surgical approach and use an Ika, Flappin’ Hog or Senko rigged weed-less to drop down into the gnarly cover. If the fish are lethargic or not apt to taking a large offering I will present them with a Shad Shaped Worm or a Kut tail worm on a 1/0 hook rigging Texas style and weight-less. I start always with a slow presentation then speed it up till the fish tell me what kind of retrieve they want. Here are some basic trends I have found that work for me regarding barometer readings. Fishing Trends: Fishing head away from cover and seek shallower waters. Look into this overlooked tool and I am sure you will find some correlations that help you catch more fish, learn patterns and find fish.